Before we proceed further, let's understand the concept of overloading. The main concept of overloading is "Same name, Different parameters or different signature". Thus, we can define as "Java Constructor overloading is a technique in which a class can have more than one constructor having the same name with different parameters list" i.e. When a class has more than one constructor having the same name but different parameters within the same class, we can say that the constructor is overloaded. 1. Overloaded constructor means you have more than one constructor in your class and to compile each constructor must have a different argument list. 2. When the multiple constructors are executed after creating an object, the compiler differentiates these constructors by taking the order, number, and the types of parameters used in the list. The following figure shows the technique of constructor overloading in Java. Let's see a simple example to understand the constructor overloading concept. In this example program, we will create three objects of class 'School'. One with default constructor with initialization value of the instance variables, second with one parameter, and third with two parameters constructor. In the above example program, we called default and parameterized constructors using different object creation. You can create any number of constructor within a class but the concept will always be the same. All instance methods receive an implicit argument called 'this' which refers to the current object. The current object is the object on which the method was called and 'this' reference can be used inside any method to refer to the current object. In the body of the method or constructor, the 'this' reference can be used like any other object reference to access instance variables, instance methods, and constructor. 2. When you need to pass a reference to the current object as an argument to another method. 3. When you need to call a constructor from another constructor. You can use this() syntax. The argument to this() must match with target constructor and this() must be the first line inside the constructor. You can learn more details about this keyword. By using this(), the duplicate code can be avoided in multiple constructors, especially when the initialization routine is complex. 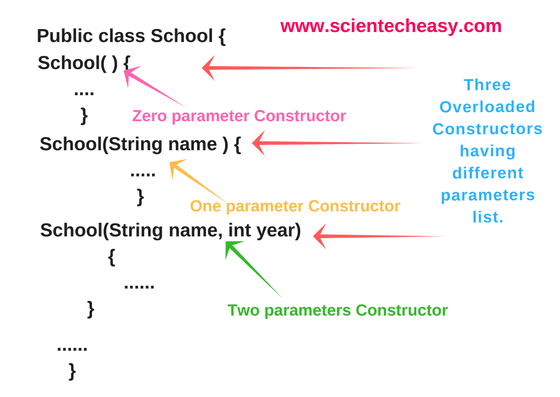 Let us take an example of Student class in which constructor Student() has an argument "name" which is similar to the name of the instance variable "name". Now to assign the value of formal argument (Parameter) "name" to the instance variable "name", we must use dot(.) before the name of the instance variable. You must follow all the above steps to make overloading. In this program, we will use Access modifier, Encapsulation, Constructor overloading, and this reference to make the program more interesting. Create another class NumberTest and call the class Number. If you have any problem to understand the Encapsulation concepts then you can learn Encapsulation in very easy ways and step by step. Practice all the programs of Encapsulation to clear the concepts. Now create another class and create the object of the class Fraction. Hope that this tutorial has covered all the important concepts related to Constructor Overloading in Java with programs. We hope that you will have enjoyed this tutorial. If you practice all programs, I am assured that you will not have any problem to understand the concepts.